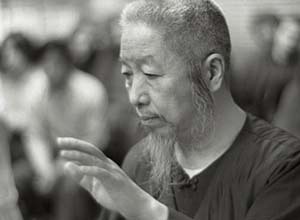 Cheng Man Ching, student of Yang Chengfu, came to New York in the 60s, at first teaching Taijiquan in the Chinese community, later also teaching Westerners. Being a university professor from an educated family and deeply rooted in traditional Chinese culture, he was confronted with flower children searching for a guru. Cheng Man Ching made a big impression on their lives, as described in Wolfe Lowenthal’s “There Are No Secrets” (1991) and in the film “The Professor – Tai Chi’s Journey West” (2016). establishing a morally sound student-teacher relationship in an environment in which the students expect the teacher to be something special, somebody to follow. What does that mean? Narrowly interpreted, it can be read as himself setting an example for his students by his actions: the advice that they should copy his behaviour instead of sticking to his words. On the other hand, it can be read as a denial of pure doctrine and pure teaching, even as an encouragement: “Try to get it for yourself – as I try to do it myself, do not simply repeat my phrases.” Lacking the means to communicate in language, Cheng Man Ching supported this latter view by his actions, as is documented below in the video statement by Ken van Sickle, one of his students. Concerning guidance, also in questions of daily life, Cheng Man Ching did not succumb to the pressure of his students to provide answers to every question. By refraining from giving answers and by not providing guidance on every issue, he thus created an open space for the students to figure things out for themselves. The Taiji teacher not being a guru in today’s terms might mean not to act as a life coach for one’s students. Not telling the students what to do in daily life, even if they turn toward their teacher to ask, means in turn not to make one’s students dependent on one’s guidance, but enabling them to find their Taiji way – and even more their way in life – independently. This ultimately results in a refusal of any hierarchy which does not stem from better knowledge. – And even if one might have (or feel to have) better knowledge of life, not to exploit one’s better knowledge to raise oneself above others.